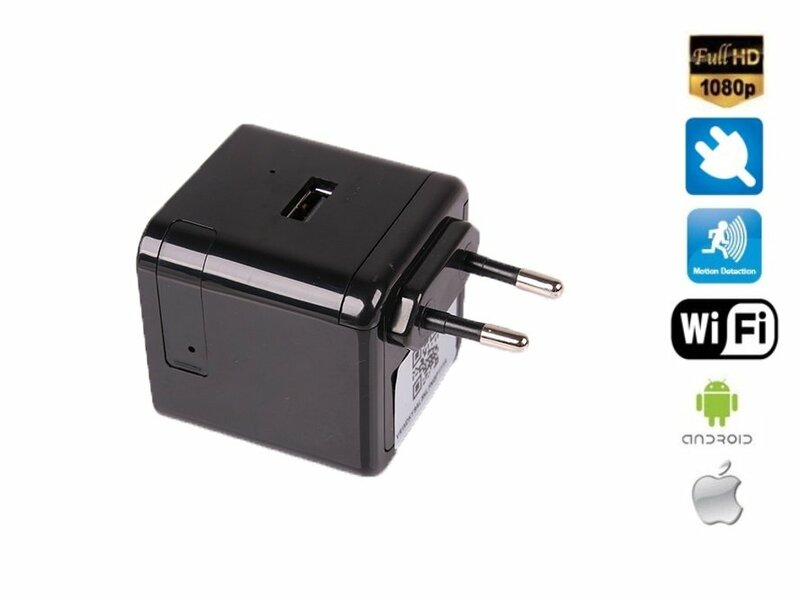 AC/DC adapter USB with FULL HD camera + WiFi + Night Vision + 128GB micro SD support, is a full-featured charger with a perfectly hidden camera. AC/DC adapter USB with FULL HD camera + WiFi + Night Vision + 128GB micro SD support, is a full-featured charger with a perfectly hidden camera for inconspicuous monitoring. The device acts as a classic charger with a USB port for charging mobile phones, tablets or other devices, so no one will pay more attention that it could be a spy camera. The camera lens is hidden behind the dark plexiglass (where 16x NIGHT LEDs are hidden, but they do not light like the classic IR LEDs) and the memory card is hidden in the body of the charger under the removable cover. The camera has a WiFi feature that lets you pair your camcorder with your smartphone via "Camwf" app (available for iOS, Android) and then you can set up various camera shooting functions or watch the recording directly from the camera. The camera activates into standby mode after connecting the adapter to the network, and starts video recording only when motion detection is detected. Motion detection saves space on the memory card. When the microSD card is full, the oldest records are automatically overwritten (loop recording), what ensures continuous operation. Records are stored on a micro SD/TF card with a maximum capacity of up to 128 GB. The unique spy camera is ideal for monitoring and recording at work or at home during your absence.